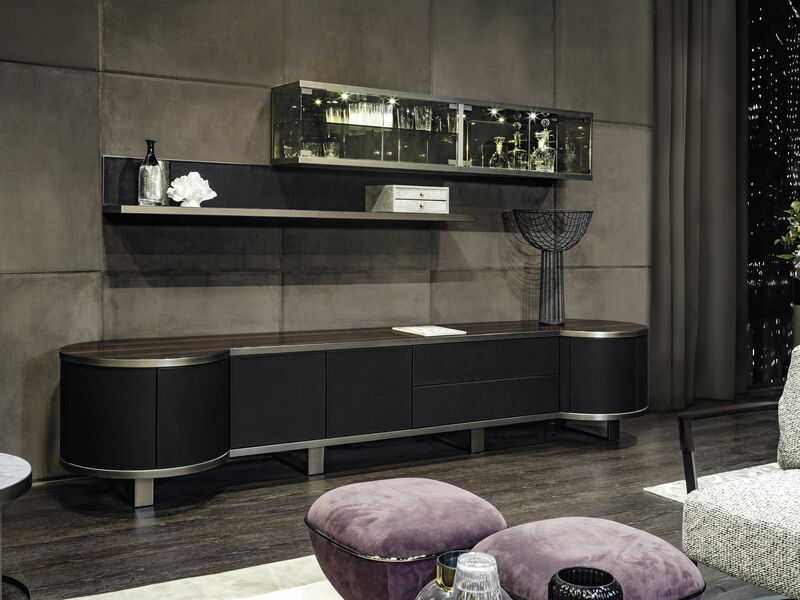 Contemporary sideboard / wooden / leather / marble - COURBET Y 775 by Giuseppe Viganò - LONGHI S.p.a.
Furniture > Storage, Shelving > Contemporary sideboard > LONGHI S.p.a.
COURBET Y 775 by Giuseppe Viganò LONGHI S.p.a. Living room unit with doors and drawers and structure upholstered in leathers from the catalogue or in wood in the finishes: - Glossy/matt ebony, - Glossy/matt Sucupira Luxury, - Glossy walnut burl wood, Ground metal edges in the following finishes: - bright pink gold, - matt pink gold, - bright light gold, - matt Champagne gold, - bright chrome, - bright black chrome, - matt satined bronze. The structure of the curved end element is available only covered in leather from the range. 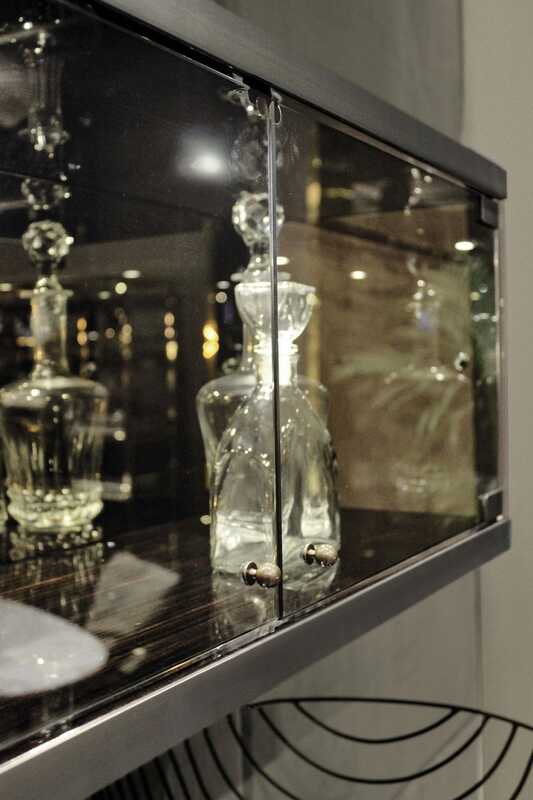 Top finishes: - Bronze or smoky mirror. - Sahara Noir marble (polyester finish), - Dover White marble, - Panda White marble, - Guatemala Green marble, - Corteccia marble, - Port Saint Laurent marble, - Red Levanto marble, - Bardiglio Nuvolato marble, - Elegant Brown marble, - Shale Rosewood marble, - Emperador Dark marble, - Silver Wave marble, - Agatha Black marble, - Frappuccino marble, - Calacatta Gold marble. Or in wood in the finishes: - Glossy/matt ebony, - Glossy/matt Sucupira Luxury, - Glossy walnut burl wood. Push-pull opening mechanisms and interiors painted bronze. The base is made up of metal legs painted bronze. 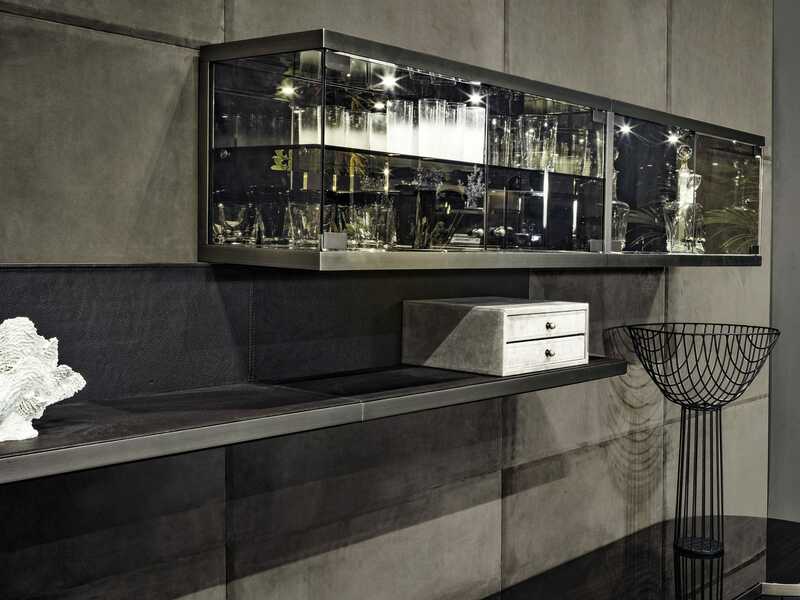 The inside of the rounded end element and of the island is bright lacquered in powder colour, and there is a turning and extractable tray upholstered in leathers from the catalogue (matching the structure), and an automatic LED light. 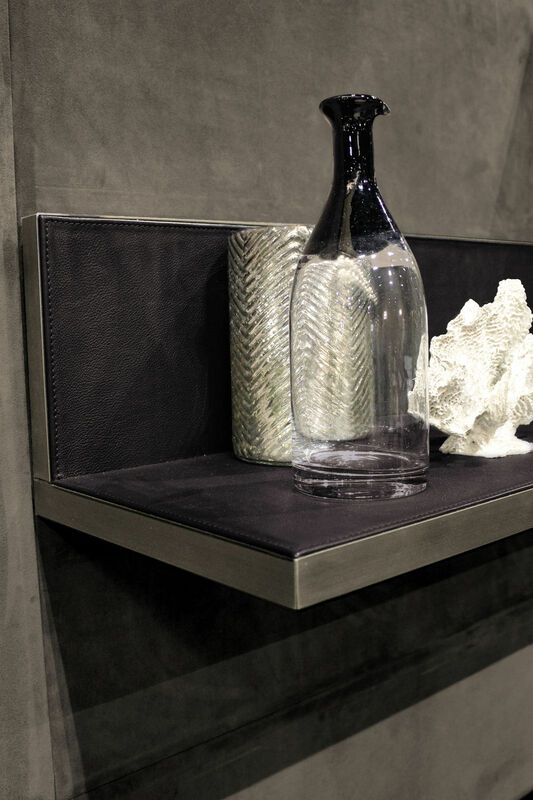 Shelf upholstered in leathers from the catalogue or in wood in the finishes: - Glossy/matt ebony, - Glossy/matt Sucupira Luxury, - Glossy walnut burl wood.